Char versus Panzer: The factors that really mattered! Notwithstanding the ‘on paper’ superiority of French armour in particular areas, the 1940 campaign would illustrate the degree to which these were degraded by a whole series of other factors. These ranged from French Army doctrine and organisation through to general design limitations and other issues, all of which combined to render the whole, in the crucible of war, to be substantially less than the sum of its parts. It is a truism that French armour doctrine at the start of the Second World War was in essence no different to that at the end of the First. The roles of the tank were that of infantry support and the provision of a mechanised equivalent of the cavalry. These two suppositions governed all aspects of tank unit organisation, their use, design and development in the inter-war period. 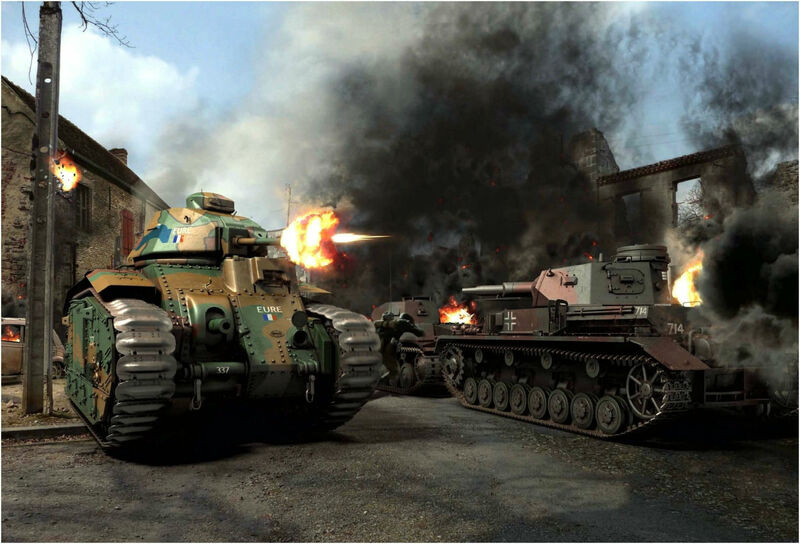 It meant that when faced with a technologically inferior enemy whose tank arm was predicated upon a far more dynamic concept of the use of armour and air power, the French were unable to respond in an effective way and went down to defeat. Cited as a maxim in pre-war French Service Regulations, tanks had to observe the requirement of only moving as fast as the infantry they were supporting. In consequence, the specifications issued for new machines to fulfil the support role rarely required that they have a maximum speed beyond 17 mph. These machines formed the core of the five Light Cavalry Divisions in 1940. These comprised a light mechanised brigade equipped with the H-35/R-35/H-38/H-39 tanks, Panhard armoured cars and mechanised infantry. It is a measure of their anachronistic structure that they still included a brigade of cavalry. The Cavalry Division analogue was to be found in the three Divisions Legeres Mecaniques (abbreviated hereafter to DLM). These light mechanised divisions were seen conceptually as mechanised cavalry. Their primary role was to advance to the fore of the main force and screen its movements – a role that Joachim Murat, Napoleon’s commander of cavalry, would have related to without difficulty save for the fact that these steeds were of steel and not flesh and blood Fielding a mixture of Hotchkiss light tanks and the more formidable Somua S-35s, two of these divisions would be involved in the largest tank clash of the campaign at Hannut in Belgium on 12 and 13 May. Evidence, however, that the contribution played by the Panzerwaffe in the rapid defeat of Poland had not gone by way of the board in France can be seen in how between September 1939 and May 1940 the French had moved very quickly to create their own equivalent of the Panzer Division. Four Divisions Cuirassees Rapide (hereafter abbreviated to DCR) were set up in short order. Three were already part of the order of battle on 10 May. The fourth, as yet still forming, was under the command of a certain Colonel Charles de Gaulle (one of the few minds in the French camp in the 1930s who had been in tune with German armoured developments and had argued for the same in France). With a mechanised infantry battalion and two battalions of artillery, the core of these formations was built around two battalions of 60 Char B1Bis. This was the premier tank of the French Army in 1940. However, it had not been designed for rapide. Its original specification had called for a machine to provide infantry support! The top speed of just 18mph illustrates the point. More numerous were 78 Hotchkiss H-39s that were also organised in two battalions. When enabled to take up static positions, the heavy frontal armour and weapons of French machines enabled them to deal without difficulty with all German tanks -their armour being so weak. When denied that facility, they succumbed rapidly to the superior movement of the Panzer formation operating in concert with other arms and the Luftwaffe. This was bound to happen at any time the Germans effected a breakthrough of the French line – be it held by infantry or armour – because of the latter’s attention to the maintenance of contiguous lines. This hangover from the Great War, when trench lines dictated the requirement to preserve a coherent front, contained within it the seeds of many errors made in 1940 by the French Army. By default it conferred many tactical and strategic gains on the Germans, who rapidly and ruthlessly exploited every opportunity provided when this effect of this anachronistic doctrine was employed. Although the new DCRs appeared formidable on paper, they had been set up to emulate a formation whose armour doctrine was alien to the French military mind. It would take more than a few months and a reorganisation of assets to copy what the Germans had done in Poland. Herein is to be seen a profound weakness in the design of French armour that was to impact on its ability to duplicate the mobility of the Panzer Divisions in Poland. We have already alluded to the slowness of French tank designs. It was also the case that the efficiency of any Char in battle in 1940 was seriously handicapped by the one-man turret they all carried. To the commander of the vehicle, who had to identify the target, also fell the tasks of aiming the gun, rotating the turret, loading the gun and firing it. Nor was he helped by the poor view provided for him by limited optics. However, all of the aforementioned were then compounded by the slow traverse of the turret. Contrast this with German design practice. Unlike their French counterparts, the German medium Panzers had crews of five men. Representing, as they did, the machines that would see the Panzerwaffe through to 1943, and in the case of the Pz IV through to the defeat in 1945, the insistence by the Heeres Waffenamt on a three-man turret design was proved by experience. A commander, loader and aimer were deemed to provide the best arrangement for the division of labour in carrying out those tasks, thereby providing the optimum efficiency of the workload of a crew when in battle. With the commander able to observe events from his cupola and communicate his orders via a throat microphone, this permitted the Panzer to rapidly move and shift both vehicle and main armament from target to target. The trump card, however, for the German way of war in 1940 was the radios carried by all Panzers, but very few Chars. In a real sense, they were the war winner. ‘Movements are carried out according to radio command, previous orders or signals (although radio was accepted as being the most workable means of command – author comment). On the order to move out, all tanks start moving uniformly and at first, straight ahead. If a change of formation is desired at the same time as the start of the move, the formation order is given first, followed by the order to move out. Distances, intervals and formation are assumed while driving…. When changing direction of the march, the commander orders ‘Follow me!’ or ‘Direction of march is…!’ while giving point or compass bearing. If a formation change is to take place at the same time, the march direction is given first, followed by the new formation. Platoons that have four, instead of five, tanks execute these formations and manoeuvres in analogous fashion’. The degree of control implicit in such a short extract and the sophistication required to effect it betokens a great expertise in radio employment. Herein lies the French bafflement at the ability of the Germans to move their tanks around en masse and effect a rapid concentration of effort and firepower where they desired it. This is hardly surprising when very few French tanks actually possessed radios. Apart from a cultural obsession with radio security, which provides one explanation as to why they were not fitted in their tanks, the other problem arose again directly out of the perception that tanks were only to provide support for the infantry. In such circumstances, radios were not necessary, signal flags would suffice and, once drawn up in their static lines facing the enemy, it was thought to be enough for an officer or runner to move from tank to tank passing on orders in person by word of mouth! The sophisticated German radio net went beyond tank to tank. It also permitted a degree of communication between ground and air that had never been seen before. Attached to the Panzer Divisions were Fliegerleittrupps-tactical air control parties – which were provided with wheeled vehicles. At this juncture of the war there were too few SPWs available to be fitted out for this role, although they would become a more familiar sight from 1941 onward. Their task was to be in close proximity to the advancing Panzers. When the tank divisions’ own towed artillery could not eliminate a target, the Fliegerleit offizier-the air control officer – elicited what air support was available and contacted the pilots on their frequency. In 1940, it was the Stuka and the Henschel Hs-123 which provided this help, with the bulk of the air support being provided by the former. The air control officer would then talk the pilots into the area so that they could recognise the target. In the meantime, troops with the Panzers would have demarcated their own positions relative to that of the enemy by laying out on the ground special identification panels. It was later claimed that the support given to Guderian’s thrust to the channel saw the most effective use of air support of the war, with Stukas being on hand to deal with targets within 15-20 minutes of being called. The Char B1 bis was an upgraded variant with thicker armour at 60 mm maximum (55 mm at the sides) and an APX4 turret with a longer-barrelled (L/32) 47 mm SA 35 gun, to give the tank a real anti-tank capacity. It was the main production type: from 8 April 1937 until June 1940 369 units were delivered out of a total order for 1144, with series numbers 201 to 569. Before the war manufacture was slow: only 129 had been delivered on 1 September 1939. The monthly delivery was still not more than fifteen in December; it peaked in March 1940 with 45. The Char B1 bis had a top speed of 25 km/h (16 mph) provided by a 307 bhp (229 kW) petrol engine. The first batch of 35 Char B1 bis used the original engine but from 1938 to May 1940 they were slowly re-equipped. Its weight was about 31.5 metric tons. The operational range was about 180 km (110 mi) which was similar to other tanks of the period. At 20 km/h (12 mph) the three fuel tanks (total capacity of 400 l (88 imp gal) would be exhausted in six hours. To improve matters, at first, trailers with an 800 litre auxiliary fuel tank were towed but this practice was soon abandoned. Instead Char B1 units included a large number of fuel trucks and TRC Lorraine 37 L armoured tracked refuelling vehicles specially designed to quickly refuel them. The last tanks to be produced in June had an extra internal 170 l (37 imp gal) fuel tank. To cool the more powerful engine the Char B1 bis had the air intake on the left side enlarged. It is often claimed this formed a weak spot in the armour, based on a single incident on 16 May near Stonne where two German 37 mm PAK guns claimed to have knocked out three Char B1’s by firing at the intakes at close range. The air intake was a 6-inch (150 mm) thick assembly of horizontal slits alternately angled upwards and downwards between 28 mm thick armour plates, and as such intended to be no more vulnerable than the normal 55 mm side plates. Over the production run the type was slowly improved. Tanks number 306 to 340 carried 62 47-mm rounds (and the old complement of 4,800 machine gun rounds); later tanks 72 and 5,250. However the B1 bis had fewer 75 mm rounds compared to the earlier B1: 74 instead of eighty, normally only seven of which were APHE ammunition. Early in 1940 another change was made when the ER53 radio was replaced by the ER51 which allowed spoken wireless communication. The company and battalion command tanks also had an ER55 for communication with higher command. The crews of the 1re DCR kept their old sets however, preferring them because the human voice was drowned by engine noise. Development of the Char B1 ter was started at the same time as production funds were given for the bis with the intention of providing a tank armoured to 75mm. A design with sloped and welded 70 mm armour, weighing 36.6 metric tons and powered by a 350 hp (260 kW) engine was meant to replace the B1 bis to accelerate mass production from the summer of 1940. In the course of the redesign, space was provided for a fifth crew member, a “mechanic”. Cost was reduced by omitting the complex Neader transmission and giving the hull gun a traverse of five degrees to each side instead. The first prototype was shown in 1937. Only two prototypes could be finished before the defeat of France. In May 1940 it was agreed to deliver nine Char B1’s each month to Britain in exchange for a monthly British production of the “H 39”. This entry was posted in AFV, Doctrine by MSW. Bookmark the permalink.